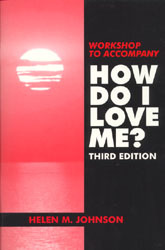 This Manual, Workshop to Accompany How Do I Love Me? 3/E, is being published at the request of people working in education, business, industry, medical facilities and government agencies who are using the innovative book on self-esteem, How Do I Love Me, 3/E by Helen M. Johnson. Although it is designed as a manual for leading a workshop lasting all day or two half days, the ideas, methods and handouts in this manual can be easily adapted for use in college classroom applications. How do I love Me? 3/E is now being used as a supplementary text in many different fields and course applications in the college setting. We feel that this manual will make it even more useful. Ms. Johnson has presented workshops on self-esteem for national conventions, local civic groups, certified and classified personnel in education, business executives and other emloyees, professionals in the helping professions, college students, and the general public. These intensive workshops are always well-attended and the evaluations of the workshop materials have been outstanding. Participants like the organization the clear step-by-step approach, and the practical down-to-earth applications to everyday life. They learn how to get self-esteem and how to keep it! It was at the urging of the workshop attendees that Ms. Johnson wrote the book on self-esteem. Now enthusiastic users of the book have asked for the workshop to be published and made availabe to them. At Work--If you don't have self-esteem, you aren't productive; because you feel you won't succeed, you are afraid to try. When you don't try, you can't achieve and don't achieve. Social life--You don't attract people if you appear to lack self-esteem. In a personal relationship, you are a "parasite" feeding on your partner in order to build self-esteem from him or her. That is not the way to get self-esteem and it soon destroys the relationship. At play--People who lack self-esteem cannot relax and have fun. They are too busy worrying about how they are performing and how others are viewing them. Alone--It is miserable to go through life with someone you don't like. People with low self-esteem are anxious and lonely when they are alone. How Do We Keep Self-Esteem?